Are Dental Implants Possible After Bone Loss? If you are looking to replace missing teeth with something more permanent than dentures, dental implants are an excellent option. Still, some of our patients worry that they will not be able to receive implants because they have lost too much bone density. To find out whether you qualify, we encourage you to call our Fort Lee office at (201) 620-9772 and schedule an examination. In the meantime, it helps to understand more about the process. Implants are the most durable and functional way to replace missing teeth because patients get more than a new tooth. Patients also get a new root system. The process works by implanting a small titanium post under the gums and securing it to the jawbone. Through the process of osseointegration, the post and bone fuse together. The body essentially deposits bone around the post until it is secure. This is unique to titanium since the body treats it as natural matter. While it takes time for this process to finish, we will attach the new tooth to an implant that will provide the same level of security and durability the natural teeth receive from roots. Upon first losing permanent adult teeth, the patient is going to experience resorption. Every part of the body has a special role to play and there are various signals that alert the brain each part of the body is in working order. In the case of the jaw, the stimulation provided by the teeth signifies that the jaw is doing its job of supporting them. Without a tooth or teeth, the stimulation goes away and the body responds by leaching calcium out of the jawbone for use elsewhere in the body. As a result, the patient will lose some bone density. In fact, within the first year, the patient can lose around 25 percent of his or her bone density in that specific area. The best way to avoid this is to replace the tooth right away. If a patient already struggles with the loss of bone density, then the patient may be unable to receive a traditional dental implant without further assistance. There are certain procedures we can perform that can help restore the jawbone. If that is not an ideal solution, mini-dental implants are also available. These implants are also strong and durable, but they are shorter and are more flexible in regards to the density levels required for stability. Many of our patients consider options like this, as well as a hybrid procedure, where a set of teeth is created and attached to a gum-like base that is then secured in the mouth using several dental implants. 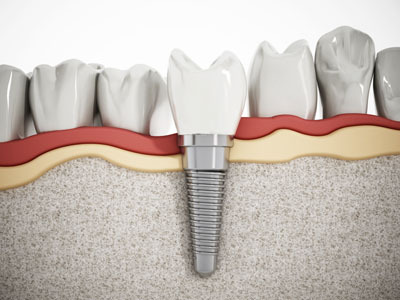 Instead of replacing each individual tooth, this solution only requires a few implants for stability. Given the diversity of the options we offer, it is certainly possible to replace your teeth using some form of dental implants, even if you have suffered from resorption. To find out which solutions will work best for your particular situation, call our office and schedule a consultation. Fort Lee Family Dental can examine you, take X-rays, discuss your goals, and make recommendations that will best suit your lifestyle.